Holiday.gr - Parikia, a trip to a myth! 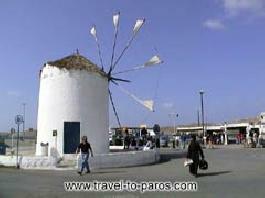 Parikia or Chora (town), as the locals call it, is the capital of the island. It is located almost in the center of the west coast of the island. The settlement extends from the sea to the outskirts of the hill, where the monastery of Saints Anargiri, is. In the same spot was the ancient town. The enchanting town keeps its traditional identity and provides visitors all comforts of a modern city. 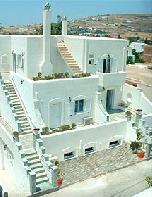 Walking in the narrow, with pebbles, paths, you will be beguiled by the magnificent atmosphere of Cyclades. Whitewashed houses, blue windows and pots with coloured flowers combine the perfect scenery for your holidays. And not just that. As anyone gets to know the town, discovers the unique way the residents have combined traditional elements with modernization, but also the marks of previous civilizations that are still vivid in the island. Pictures follow one another and fascinate every visitor. Highly impressive is the castle of Venice of the 13th century in the center of the traditional settlement. The houses of the small castletown are built others on the road and others incorporated to the walls of the castle. Like a live art picture, it takes visitors back to romantic times. The church of Panagia Ekatontapiliani, the island's precious ornament and the small byzantine churches, masterpieces of folklore architecture, give important information for the orthodox history. Walking in the narrow streets of the town you may have a lot of surprises, such as the neoclassic mansion houses of the 18th and 19th century that will attract you at once. There are a lot of other important archaeological and byzantine monuments in this region. The archaic cemetery in the beach of Parikia was in use from the 8th century BC to the 2nd century BC. The sacred of Asklipe and of Pithy Apollo of the4th century BC located on the road to Aliki. The ceramic workshop of the helenistic times, in position Tholakia. The remains of residences from hellenistic times, with mosaic floors, located in Kastrovouni. All of them are important pieces of the island's history. Don't miss them. The nearby beaches are famous for their good organization and clarity. Most popular of them is beach Livadia located in the north side of the town. It is an extend beach with very clean waters that provides all comforts of an organized beach. The beaches of Krios, Kaminia, Agios Fokas, that can be approached only by boat, are an exceptional proposal. 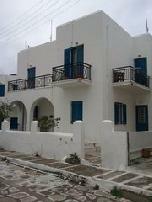 Parikia's touristic foundation covers the needs of every visitor. There are a lot of hotels and rooms to let in the town. And as for your entertainment, Parikia is the leader in this field, too. A lot of restaurants and taverns with recipes of the local cuisine can promise you delicious meals. 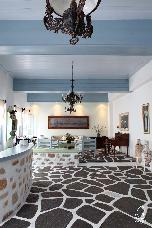 And to continue, the bars with greek and foreign music and the clubs with live music promise you unforgettable times. Been to Parikia ? Share your experiences!